Novotel's "Le Café du Commerce"
General Manager of Novotel Gangnam Jerome Stubert (fifth from left in the back row) poses with his staff and the members of "Le Cafe du Commerce" on May 10, 2007. On Aug. 9, 2007 A group of both locals and foreigners gathered for a friendly meeting at Novotel Ambassador Gangnam's "Le Café du Commerce." The lovers of French food and culture were socializing each other, wining and dining at a very reasonable price of 18,000 won per head. 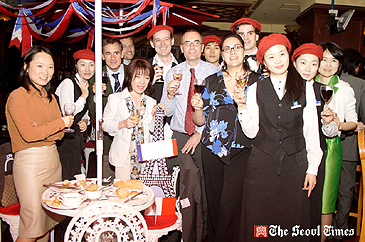 The monthly "rendez-vous" party, hosted by the hotel, provides a good opportunity for them to exchange views and thoughts on French culture. On the second Thursday of every month scores of them meet, sampling a dozen snacks with especially selected wines (one white and red wine). They can drink the wines as much as they want. On that particular evening wine tasting of several top-qulaity wines were offered to the members and guests there. "It is also a great chance to promote bilateral ties between Seoul and French at the level of the grass roots between the people of Korea and France," says its General Manager Jerome Stubert. He is the ardent member of this social club. As top officer of the hotel, he was busy attending the needs of every guest there that evening. "I'd love to spend time with my customers, who are members of this club." Many of the "Le Cafe du Commerce" members speak in French although some use English for dialogues and socializations. General Manager Jerome Stubert of Novotel Ambassador Gangnam poses for camera at its "Le Café du Commerce." Members comprise local college students of French language and literature, French businesspeople, and local office workers. Anybody, both local, French, or any nationalities can join the party. "We planed this French style party to strengthen diplomatic ties between the two countries (S. Korea and France)," said Mr. Stubert. He has been living in South Korea for over two years. As a multilingual and multicultural, he has spent 15 years in Asia. He said that the French food is very complex and diversified. "Even though French food has many different styles, it's not as spicy as Korean food," he said. "I love Korean food especially Kimchi." According to the general manager, the "Le Cafe du Commerce" party was originally created in November, 2006 on the occasion of 120th anniversary of the diplomatic ties between South Korea and France. The party was designed to boost friendship between the two countries by giving local Koreans easy chance to taste the French culture: wine, fashion, food, and the language. 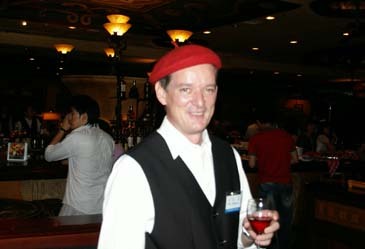 Mr. Stubert said that French people start conversations by talking about food and wine. "If you're interested in exploring the French style of interaction, you can join the party on the second Thursday of every month," he added. Mr. Stubert started his career in the hotel industry with Accor Group in 1983 when he became the assistant manager at a restaurant in France. Since his joining Accor hotels, he's been through the various positions within the organization, ultimately reaching top manager's level. 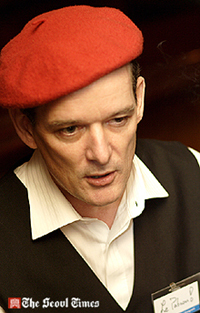 After a dozen years of internal development including three years of his stint in Africa, the French native started his hotel career as general manager in 1994 when he joined at Novotel Samui Resort in Thailand. He also took the position at Ibis Arcadia Jakarta (Indonesia), Novotel Yogyakarta (Indonesia ), Novotel Surabaya (Indonesia), and Novotel Bangna Bangkok in Thailand, his last destination. With over two decades of his commitment in hotel industry, the general manager has served mainly around East Asia (Indonesia and Thailand) and France throughout his career. Through his long career in Asia, Mr. Stubert has developed his understating of Asian culture. As a spiritual person, Mr. Stubert practiced such martial arts as Karate, Aikido. He also specialized in shiatsu, type of body massage to relieve pain. His strong attachment to Asian culture is the source of his strength for his career in Asia as well as his current position at Novotel Ambassador Gangnam in Seoul. He is married and has one son and daughter, who are attending school in Seoul. About "Le Cafe du Commerce"
For details or inquiries please contact the PR team of Novotel Ambassador Gangnam at 02-531-6492.